Competing in sport for one’s country is an incredible honour which few South Africans get to experience. There are some sports which are just logistically more difficult to organise and fund, particularly when the competition is being hosted on horses, and overseas! 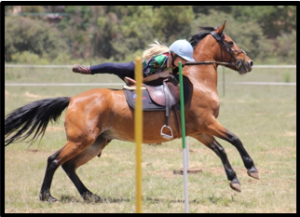 options in training (OIT) has supported the fundraising efforts for the SA teams competing at the Nations Mounted Games Championships from 2013-2017. The annual Nations Championships involve countries outside Europe who compete in the international English Mounted games team events. Australia, Canada, South Africa, New Zealand and the USA take turns to host the competition, which involves organising world class arenas, ponies, referees, accommodation, local sightseeing opportunities and good old fashioned SA hospitality! South Africa hosted the 2013 and 2016 Nations Championships in KwaZulu Natal, with teams travelling to New Zealand, Australia and Kentucky, USA in the interim. With the exchange rate against the travelling South African riders, teams engage in a number of fundraising events between team announcements and flying overseas. 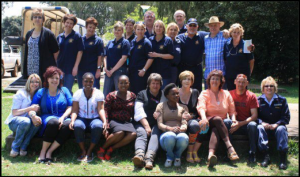 The OIT team have sold a number of things to assist with the fundraising efforts from Barnyard Theatre and raffle tickets, books, pony rides, pancakes and boerewors rolls to running bingo evenings, horse shows and Survivor team events! 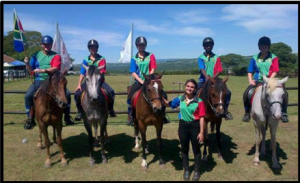 The options in training team support these International Mounted Games Association (IMGA) riders who juggle their day jobs; ranging from vets to horseback safari guides and university students, with their sport. It is one of the few sporting codes where teams consist of men and women, and compete on equal footing. Photo 2: The 2014 team in New Zealand in their Rainbow Nation kit! The host nation get to ride their own mounts, whereas visiting teams get the chance to meet and ride their pool ponies several days before the competition starts. This is immensely challenging since riders and mounts work as a partnership, so riders need to be able to ‘read’ the borrowed ponies and adapt their techniques to suit! Ponies, which are smaller than horses, are used in competition as it is easier to pick up equipment from the ground, leap off and vault back on again at a full out gallop on shorter mounts! Riders have to be athletic, agile and adaptable, have phenomenal hand-eye co-ordination, nerves of steel and excellent team work skills. Nations riders traditionally ride in eye-catching ‘Rainbow Nation kit’ and as a result of these international events, the sport has grown considerably over the years and the level of riding has improved in leaps in bounds. Now that’s exactly what a training company likes to hear from the sportsmen and women they support! Three of our OIT team members put these words into practice when they decided to join their local Community Police group. After completing their initial training, hours of patrols and assisting at incidents, in 2012 they decided to specialise in Victim Empowerment (VE), as first responders at crime and accident scenes. It was a change of pace for our MD, Ann Clarke, and even more so for our trainers Chantal Gomes and Michélle MacKenzie, as they went through weeks of intense training by numerous professionals, examined case studies and participated in role plays on giving Victim Support. On completion of the 2015 VE training the group was given a practical assignment to be completed in the month ahead. Companies, like options in training, as well as families in the community, donated components to make up VE Support kits for the Victim Empowerment team members. In addition, Dignity emergency bags for men, women and children were put together with basic post trauma necessities to be handed out to victims at scenes. This has proved to be an on-going project as Dignity bag stocks need to be continually replenished, and additional useful items are being identified to be included! As Victim Empowerment and Support volunteers, Chanty, Ann and Michélle continue to work towards Margaret Mead’s definition of achievement, with the help of an increasing number of supporters. options in training has supported this annual Country Lifestyle Expo, held in the South of Jo’burg, in a multitude of ways over the years! 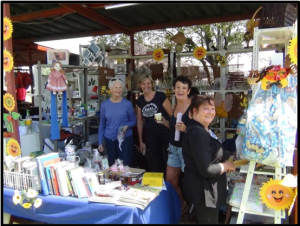 The event has an old world charm about it, reminiscent of old platteland farmers’ gatherings with ox wagon rides and sheep shearing services available, poultry and rabbit showings, and locally produced koeksisters, huge pumpkins, mohair scarves and rural landscapes in watercolours vying for top accolades. But most importantly, this show is a celebration of community enterprise, spirit and local fun. But it takes a full year to plan, and multitudes of volunteers to run a show this size. The options team has sponsored prizes for the Mr and Miss Walkerville competition, jumps for the horse show events, expertise to adjudicate in the crafts competitions and (wo)manpower to run the Walkerville horse show and ‘man’ the Conservancy or Abbeyfield Retirement Home stands! 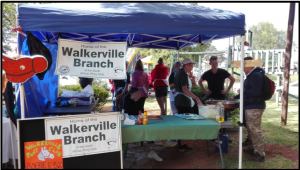 The weekend of the 10th and 11th of March 2018 was the 56th Walkerville Agricultural Show. When the Midvaal Executive mayor, Bongani Baloyi, planned a visit to the Walkerville show grounds to enjoy a meal of eisbein, sauerkraut and craft beer…he got more than he bargained for! The Community Police (CP) manned the entrance gates, ensuring safe parking and security for the multitude of stallholders, livestock and animal owners, locals and guests from far and wide. The Midvaal CP demo was a simulated car heist, and TV canine celebrities, the JOY dogs, who feature in the Dulux adverts, showed their ability to count and read! Michélle put her public speaking skills to work by commenting on both dog and horse events in the main arena over the weekend. Ann worked tirelessly all weekend at the Abbeyfield White Elephant stall to ensure that there would be no rent increases for residents if the committee could help it! 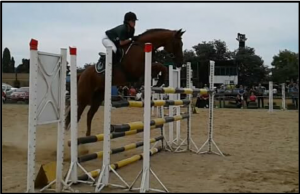 Chanty and Michélle sold boerewors rolls at the Walkerville Pony Club stand on Saturday and ran the show jumping classes on Sunday. This non-profit sports club caters for pony mad youngsters who have the most fun they can with their equine friends, but are all the while developing into knowledgeable young adult horse owners; able to pass on the training and expertise they acquired from this international youth organisation. It was a long weekend of volunteering for the options team, but the satisfaction they received from giving of their time and effort is priceless…which is precisely why they are going to do it all over again next year! 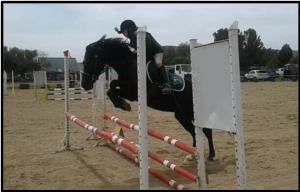 Photo 10: The winner of the Five – Bar Power Jump competition; another Walkerville branch rider!